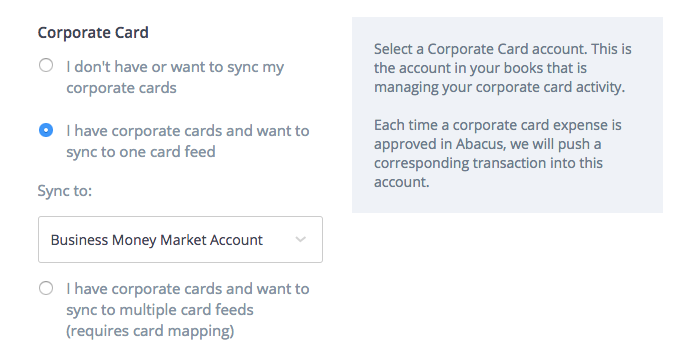 The Team Cards feature allows an Abacus admin to invite all corporate card users to connect their company cards. This allows central management of each of your cardholder’s corporate cards, and gives you real-time insight into corporate card spend. If you are using Business Tier cards, this is contingent upon each cardholder having their own set of login credentials for all financial institutions excluding CapitalOne, Chase, American Express, and Citi. If your team does not have individual login credentials please get in touch with your bank rep or just run an online search for “Enroll in Online Banking + Bank Name”. If you’re a Chase user, please click here to learn about enrolling in online banking. To add a card program to your account, start by navigating to your Team Cards page and clicking the "Add Card Program" button. We offer direct integrations for all commercial tier programs, as well as all SVB, CNB, Square1, and City National Bank cards. If you are using a commercial tier program, please contact support@abacus.com to get started. Companies with American Express, Chase, Citibank, and Bank of America business cards will only need the master or authenticating login credentials to connect the full card program. These are the primary login credentials that were created when the account was initially setup. Once connected, Abacus will pull in all cards as long as transactions on the card have posted. If you select "all other banks" you'll be asked whether your cards are Commercial Tier or Business Tier. If you're not sure, having a dedicated bank rep probably means your cards are Commercial Tier, and you can ask them to confirm. After choosing your bank, you can select a transaction pullback date. This will be the default “start date” for all of your cardholder’s transactions, when they connect their cards to Abacus. After you’ve selected your bank, you will see the card account appear on the top of the Team Cards page. The “connect card” button will take them to a portal where they can enter their corporate card login credentials, and connect the new card. The cards will show up in the personal accounts of the employees who've been assigned a card, and you will be able to view all card activity on the Team Cards page. By selecting “assign cards”, you’ll see this module appear. Once a card is connected, you’ll have the option to re-assign and remove cards as you need. 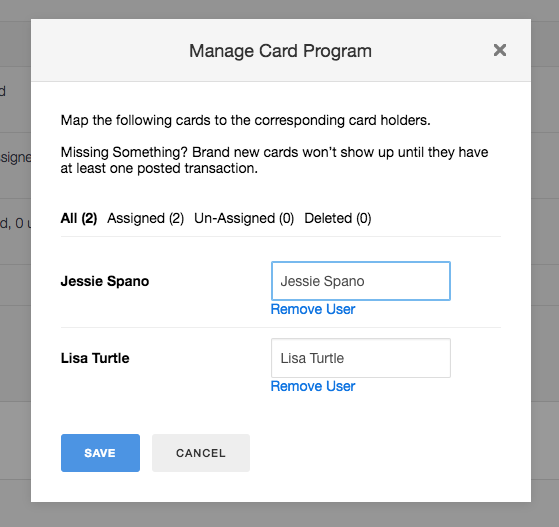 On your Accounting Sync tab of your settings, scroll to the bottom and you can choose to connect to a single card feed in your accounting software, or multiple card feeds. When transactions are approved by an admin, they will be synced into your accounting software and automatically matched to the card feed. Selecting your card feed here is required for the sync to match transactions to the correct card feed in your accounting platform.